The AR-001 mooring line separated in a splice in the 3/4" nylon, 1415 m below the surface buoy on January 11, 2011. 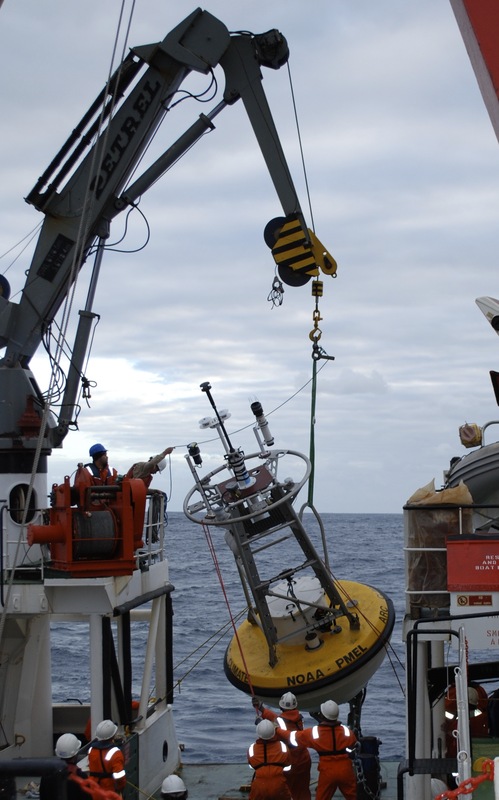 All subsurface instruments on the wire continued to function while the buoy drifted eastward. The buoy drifted over 1000 NM, and was recovered on March 9, 2011 by the R/V MARION DUFRESNE at 40.5°S 50.5°E. It has not been re-deployed. 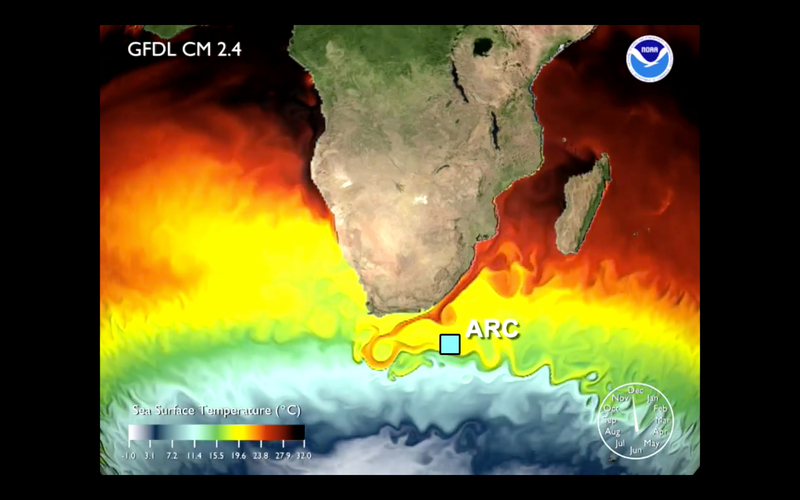 When using ARC data in scientific analyses, users should consider the actual position of the buoy rather than its nominal position. The nominal depths should NOT be used for sensor depths. Instead, the time-varying subsurface pressure of the sensor should be used to determine the measurement depth. Refer to the mooring diagram (link) in the table below for exact specifications. The positions noted in the table indicate the location of the buoy after settling into its watch circle following the anchor drop. 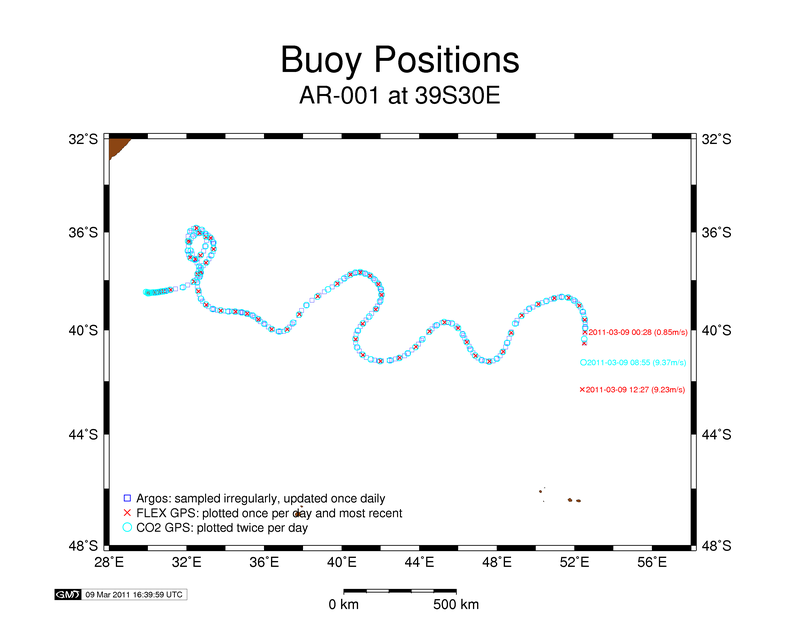 GPS position transmissions from the ARC mooring show the track it followed while adrift in the Agulhas Return Current.